The capitalist mindset is a natural human trait. PROUT acknowledges the value of all human competences and utilises them for progress, maximum utilisation and rational distribution. Natural capitalist-constructive capabilities such as capital formation, financial management, etc. will continue to serve human beings under PROUT. Society cannot do without natural human traits, and their suppression by any violent means would only lead to bitter reactions. Capitalism, on the other hand, is the collective form of capitalist exploitation. Under PROUT, capitalists, like the other psycho-social classes, will function constructively in the natural rotation of the social cycle. The successive onset of the dominance of the various psycho-social classes will be ensured and resolved through the leadership of the de-classed " sadvipras. 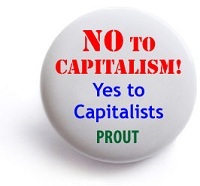 According to PROUT, capitalist exploitation is three-fold: Economic, Intellectual and Spiritual. Economic exploitation will cease when money no longer may be accumulated freely by a few. Intellectual capitalism will cease when the intelligentsia no longer will slave for money but will focus on collective welfare. Spiritual capitalism will cease when self-seekers will come out of seclusion and emerge in the midst of society where they may contribute to its vitality in their own way. In a proutistic socio-economic setup profits will be minimized to the advantage of increased consumption and rational distribution of basic necessities and increasing amenities. Hence capitalists will not get any scope to exploit workers. Under PROUT, the distribution of essential commodities will be done through consumers cooperatives. As a consequence middlemen and profiteers will be eliminated. Under PROUT most industries will run as cooperatives where shares will not be transferable without the permission of the cooperative, which will make the amassing of shares an impossibility. PROUT recognises the importance of 1) internal urge and 2) external pressure in the effort to strengthen individual morality and public morale. Every person has an internal desire to become good and fulfil his or her infinite potentiality. At the same time everyone needs to be supported and corrected in their development. This compound principle will have to be applied in the case of capitalists, too, with their strong tendency towards accumulation and economic control. Today capitalists are exploiting local economies and draining their wealth. Large percentages of profits are spent outside the local area and remitted to outside stockholders and parent companies. Such dynamics will simply not be allowed under PROUT where members of society will have to merge their socio-economic identity with that of the locality. The present system of investing capital by engaging others in productive labour to earn a profit will not be allowed under PROUT. Private enterprises will exist only outside the sphere of essential goods. Such enterprises will be limited in scope and size and owners shall have to be employed. "In order to follow the principles of PROUT, rich people will have to fight against sin and injustice, and in order to conduct such a fight properly, they will not be able to keep their wealth – they will have to become middle-class." – Sarkar, in "Shudra Revolution and Sadvipra Society"